Hello friends, thanks for calling by. 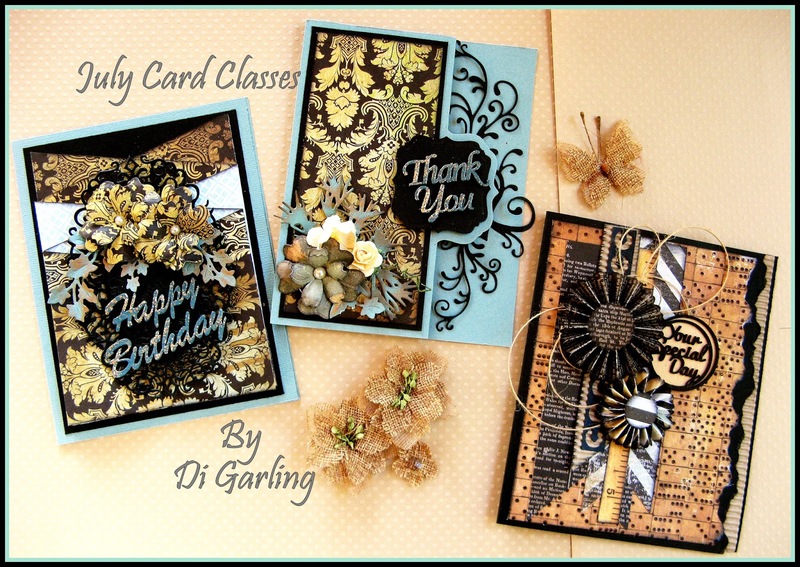 Today I have the three cards that we will be making in both of our August Card Classes. A lovely classical colour palette, again with a touch of vintage, & as always, lots of handmade flowers & pinwheels too. The one on the left is a fabulous detailed fold, adorned with some pretty handmade flowers & some faulous die cut ivy trimmed with bronze metallic ink. The middle one is created using a new die we have just got in stock in the shop & we love the way it just cuts the whole thing out for you. Too easy. The right hand one is for the males in our lives & is adorned with handmade pinwheels. Would be a great Fathers Day card. purchase in our store at The Entrance too. Hope to see you in class, but if you cannot make it to class, we also make kits that can be mailed out. Ring the shop for details. Class Times Friday 14th August from 10am to 2pm OR Friday 28th August from 10am to 2pm Cost is $35 for the 4 hour class & includes all materials & equipment. Even if you are a beginner we help you along the way & you will soon be making cards like a pro. Ring the shop on 433-44451 to reserve your place as our card classes fill up quickly.